The Chihuahua is book based on Francesco Cochetti’s “Il Chihuahua”, which was published in Italian in 2009. This updated book is a collaboration of well established and respected breeders and handlers, as well as more novice breeders. Everyone have contributed by telling their own views and experiences. – Where does the breed originate from? – How is life with Chihuahuas like? – What does it take to become a successful handler of the breed? – What does it take to become a successful breeder of the breed? Pekka Hannula is proving adept at supplying titles for a niche market, having previously published the much acclaimed KEYS TO TOP BREEDING. Now he has produced a highly individual breed book, THE CHIHUAHUA by Francesco Cochetti. The title, first published in Italian, has seen several changes for the English edition which is unlike any other breed book I have read. The history of the breed, much of which still remains conjecture, is summarised neatly and the book soon gets into the nuts and bolts of the breed – which, after all, is what any reader of a specialist breed wants. Francesco’s parents bred and showed Poodles in Italy and it was only when he married his Finnish born wife Tuula that he became involved with Chihuahuas, a breed to which Tuula had turned her attention whilst still a schoolgirl, having built her Misty Meadows kennel on the best foundation stock she could find in Britain. Touchingly, the book is dedicated to Tuula Lehtinen Cochetti. Pertinent questions about the Chihuahua from a breeder and exhibitor’s perspective are asked of several breeders from various countries, including Francesco’s long term friend and mentor Graham Foote. The Chapter which expands on the Breed Standard is a masterpiece that could only be written by someone who has a deep passion for the breed and understands every little nuance of it. This chapter alone should be compulsory reading for anyone contemplating judging this fascinating little breed. 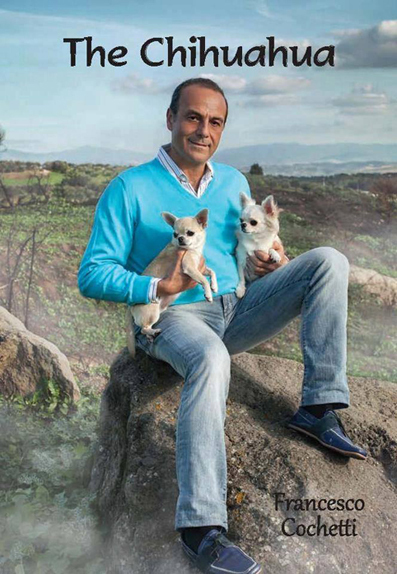 Oftentimes the breeding section of breed books has a tendency to become rather scientific but in Francesco’s book it is evident that it is written by someone who has been there and done it, very successfully, yet not ignoring the pitfalls and problems with which Chihuahua breeders have to cope from time to time. Right through the book there is a palpable personal touch, as if it had been written specifically for a close friend. Amongst the experts who have been asked to answer detailed questions is Javier Gonzalez Mendikote who has, as a professional handler, guided many of Francesco and Tuula’s top winners to great heights. His insight into the handling and understanding of the breed is truly fascinating. The book is lavishly illustrated with colour photographs of quality Chihuahuas, refreshingly not only Misty Meadows and Di San Gimignano (Francesco’s own family kennel name) dogs but of countless dogs worldwide whose merits have impressed Francesco. You do not need to be a Chihuahua owner, breeder or judge to enjoy all that this book has to offer and it could well prove a benchmark for other breed books in the future.